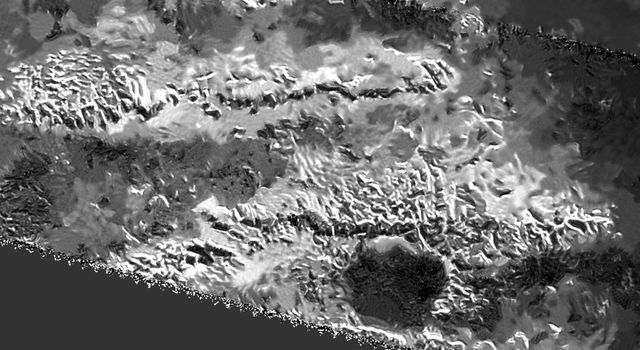 What Mysterious Forces Are Creating Mountains on Titan? In the winding-down period of its more than 12-year mission exploring the Saturn system, NASA's Cassini spacecraft has spotted the tallest mountain of Saturn's largest moon, Titan, a peak in the Mithrim Montes range near the equator that rises over two miles above the moon's surface. 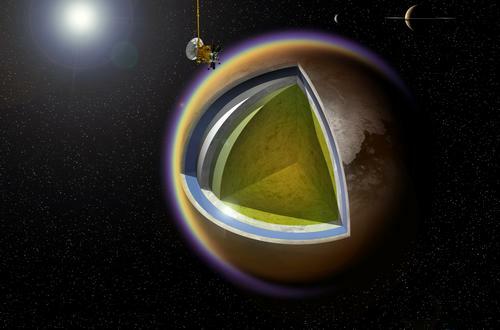 The Cassini spacecraft measured the peaks of Mithrim Montes using its radar instrument to penetrate the layers of thick, smoggy haze in Titan's atmosphere. The highest of the peaks is 10,948 feet high, and most of Titan's highest peaks, which are found near the equator, are close to 10,000 feet tall. Comparably high mountains on Earth include Cathedral Peak in Yosemite, Mount Lassen, and Telescope Peak in Death Valley National Park (whose entire height, from sea level to summit, can be viewed in one stunning vista from the valley floor). The discovery of nature's geological extremes—extreme heights, extreme depths, extreme scales—is something that may excite the adventurous spirit in us all. However, scientists have a more practical purpose for taking such measurements, in this case probing the origins and understanding the forces that form the solar system's highest mountain ranges. Though one might climb a mountain "because it's there," the mountains themselves are there for a more concrete reason. Mountains are structures formed by dynamic forces that actively push them upward—for example, the collision of tectonic plates, which is the driving force uplifting Earth's tallest mountain ranges. Volcanism is another process that builds mountains. And, on some worlds, like the planet Mercury, uplifted features may be formed when the planet or moon cools and contracts, and wrinkles form on its surface. On planets and moons with atmospheres—in particular, those with active surface weathering processes—mountains gradually wear down as erosion scours their surfaces. On Earth, the towering Himalayas, Andes, and Rocky Mountains are examples of relatively young mountain ranges pushed upward by the collisions of crustal tectonic plates. The Appalachian Mountains along the east coast of North America, today a gentle range whose highest points are less than 7,000 feet above sea level, have been weathered down since their formation 480 million years ago. 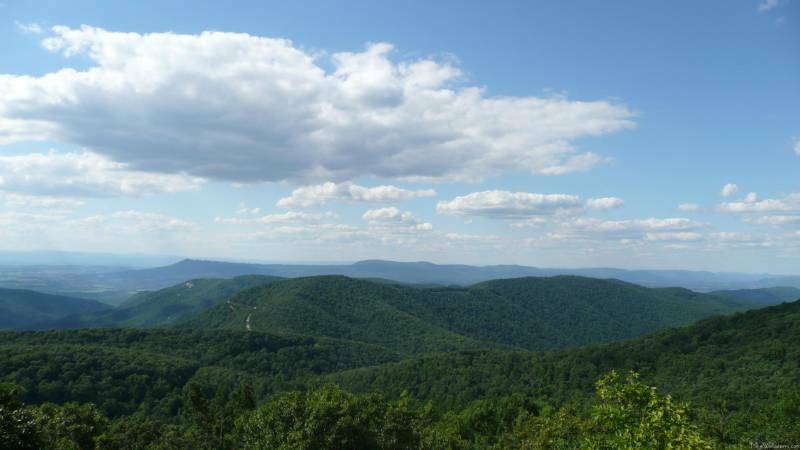 In its heyday, however, the Appalachians were a mighty range comparable to the Alps and the Rockies. What Is at Work Under Titan's Surface? The presence of Titan's tall mountains is intriguing, particularly in light of the fact that Titan's thick atmosphere and erosive weather cycle of liquid-methane precipitation and runoff are at work wearing them down. This suggests that some active process may have raised the mountains relatively recently. Candidates for the mountain-building forces responsible for Titan's ranges include tectonic activity driven by a deep subsurface ocean of water that Titan's crust floats on, tidal effects from Saturn's gravity, or the contracting of the moon's surface as it cools. By studying their size, location, and distribution, scientists hope to learn which of these processes might be the culprit, and how it may still be shaping Titan's surface today. Throughout the solar system we explore the tallest mountains and mountain ranges of many planets and moons in order to reveal unseen processes masked by their surfaces. Pluto's Norgay Montes tower 11,000 feet high, while Mercury's Caloris Montes reaches a similar 10,032 feet. On Venus, Maxwell Montes, whose origin is still under debate, climbs to 35,904 feet. On Mars, the vast shield volcano Olympus Mons—the highest mountain in the solar system—rises a breathtaking 69,650 feet above the Martian surface. Earth's own Mount Everest, at 29,029 feet above sea level, along with the entire Himalayan mountain range, was uplifted by the collision of the Indo-Australian and the Eurasian crustal plates. The Cassini mission is coming to a close. In September 2017, the spacecraft will be deliberately de-orbited and burn up in the atmosphere of Saturn, ending a 13-year expedition of remarkable discovery. Between now and then, Cassini will make about dozen close flybys of Titan, so there's still time for a few more long-distance extreme-mountaineering runs….